From colorful planters, planter stands and birdbaths, here you will find very interesting decors that will cheer up your yard for sure. Below you will also find some interesting ways to reuse the old drawers, ladders, and improve your diy skills. So, let’s check them out and draw some inspiration. Enjoy and have fun! If you have some free time, you can try to make some fun planters that will brighten up your space. You can use stones, containers, old bikes, etc. to make your very own planters. There are also many colorful and graceful planters in the stores that can add dimension and color to your garden too. Use a drawer, ladder or shelf to display your beautiful flowers and herbs. Take a look at your garage or basement, you probably have some of these items. Paint them in some bold color and display your favorite flowers. Instead of throwing away your money on an expensive birdbath, you can make a very cheap birdbath design. The idea below is very easy and creative. You can express your creativity and paint the stones in your yard. Below you can find ladybugs and turtle ideas that are very easy to make and look very cute and fun. You can turn the old terra cotta pots into gorgeous mushrooms or into a wonderful terra cotta man. So, what do you think about these garden decors? Do you find them fun and attractive? 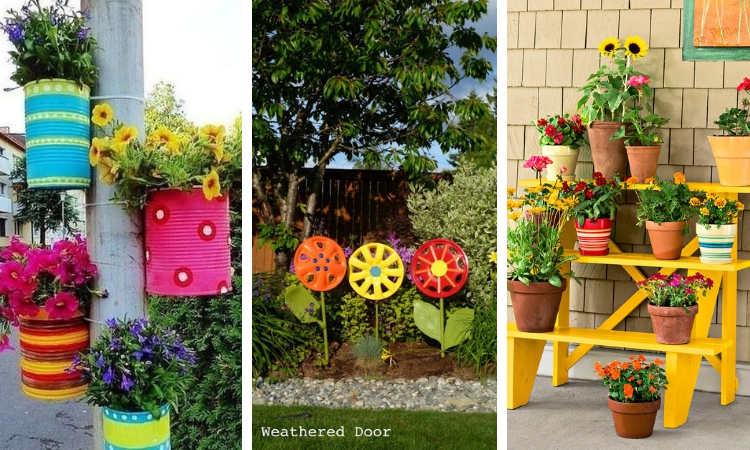 Which one is your favorite and would you like to make and beautify your garden? Thank you for reading!